Last week I flew up to Washington to check out the Tulip Festival in Skagit Valley. When I landed I had to get a rental car. Walking up to the counter was what you would expect. Nothing special, but after providing my name and reservation information the conversation lead to something unexpected. "You should go to Snoqualmie Falls" explained the teller at the Thrifty rental car checkout. "Oh it is up on Hwy 90". The conversation continued with more pleasantries, but that one suggestion stayed with me throughout my Washington adventure. The last day in Washington, I found myself with quite a bit of time before my plane was scheduled to take off... so I decided why not!? When else would I be able to see this waterfall? A rare chance, but most likely never. Traveling up the the falls was absolutely gorgeous. 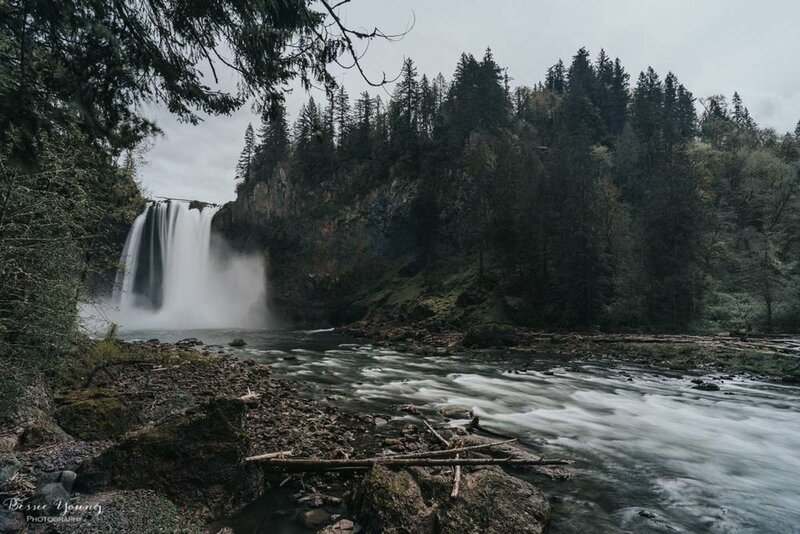 You end up going through a few little towns and then find yourself reading the sign 'Snoqualmie Falls turn out 1000' ahead'. No, I didn't do any research for this adventure, and I had no idea what I was going to find. It ended up being absolutely amazing! There were quite a few people at the Snoqualmie Falls with not alot of parking. As you walk toward the falls you hear the loud roar of the water, then you see the fence, then the look out, then BAM there it is.... an amazing, powerful, roaring waterfall. There was an upper lookout and a lower lookout. Both lookouts had a parking lot, but I didn't know this at the time. I learned about the lower parking lot after taking the trail from the upper lookout to only find myself in a lower parking lot leading to the lower lookout. :) Hey, I guess I needed a bit of a hike and a sweat session to get the complete experience. The trail was absolutely awesome and I am glad I took it. It was all uphill and downhill, so if you go on this adventure make sure that you are prepared for the hike. There are signs all along the way telling you what plants are what. I am obsessed with learning plant names so this was an amazing surprise for me. The lower lookout was just as awesome as the upper lookout, if not better. This lookout allowed for you to see the river along with the falls which made for an amazing image. After checking out the falls I headed into the town of Snoqualmie, Washington. This is where I had lunch and then planned my route back to the airport to catch my flight home. Basically, what I learned from this experience is that if you find yourself with the time and your wanderlust voice is getting the better part of you... just do it! You won't regret it. 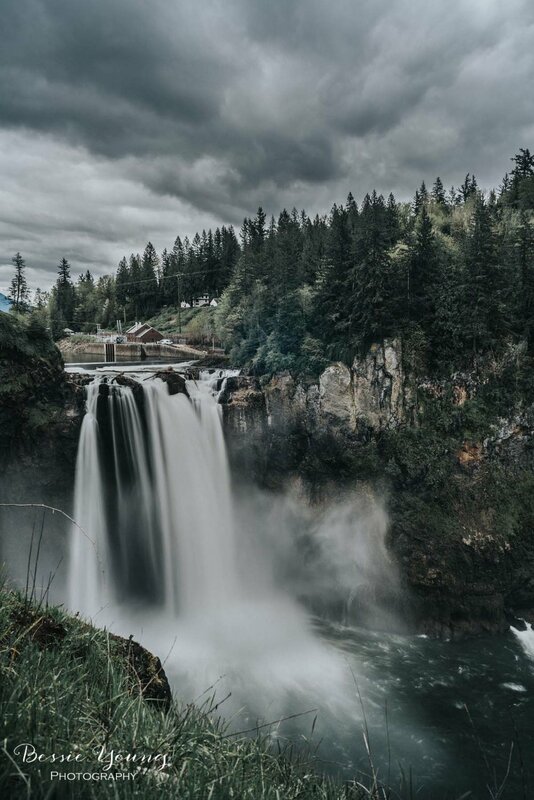 The place may be a complete bust, but then again the place may lead you to a magical gorgeous place like Snoqualmie Falls, Washington. If you are interested in purchasing any of these photos, my Landscape prints are for sale here. Wishing you all nothing but fun adventures!